Jävla skitsystem! • Stupid bloody system! '"Stupid bloody system!" That, approximately, would be the English title of my book ("Jävla skitsystem!" in Swedish). 'It is also something that a lot of you probably have muttered at work; over computer systems, databases, intranets that are hard to navigate and impossible to comprehend – but that you are obliged to use, nevertheless. 'And why is it that although every new computer system is designed to save time and make work easier, we just seem to get more and more stressed? 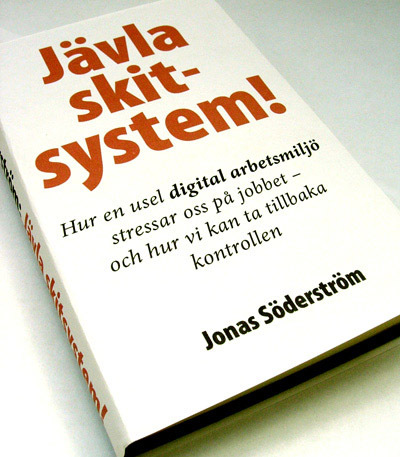 'In the book, I show how bad computer systems have created several new kinds of work-related stress. Badly-designed systems demand an unnecessary cognitive load. The biggest strain from computer work is no longer on your elbow or eyes; it is on your brain. 'To a great extent, this has been overlooked by the traditional field of occupational health and safety. And even the people affected tend to blame not the systems, but themselves: "I'm too old. I guess I'm stupid." 'There are ways to design, develop and implement good computer systems. Yet the book is not intended for programmers in the first place, but for the common user – encouraging her to cry "Stupid bloody system!" more loudly and more often. Good to see Jonas about his book on 16 November 2010 for a good seven minutes on national television (click to view)!